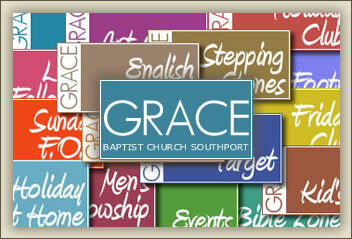 Grace Baptist Church Southport invite you to our annual Missionary Weekend. 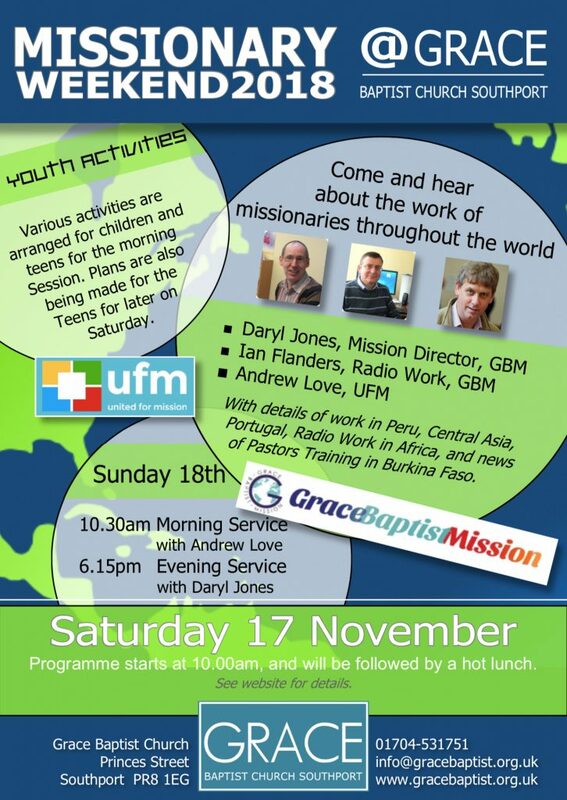 Taking place on 17-18th November, we look forward to hearing reports on the Lord’s work from many parts of the world. 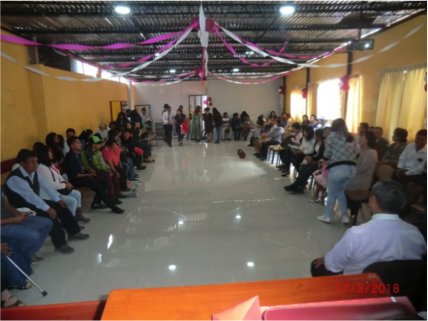 This year, out missionaries are going to be including items not just for adults, but also for children.These will take place during the main sessions, as well as in some breakout sessions. So please do bring your children along too. Please read the enclosed leaflet for more information about our speakers, as well as details of times and our hot lunch. You can park on the streets around the church using the meters, and pay £1.50 for up to 1 hour, £3 for up to 2 hours, and £5 for up to 4 hours. Some meters also accept £7 for anything over 4 hours. The meters take cash, credit/debit cards, contactless, and ApplyPay. There is an NCP Car Park on London Street, which can be pre-booked for 5 hours costing from £7.20 on the NCP website. The Sports Direct multi-storey car park on Tulketh Street is the closest and probably the cheapest. It is a camera on entry and pay on exit car park, and charges are 30 minutes parking for 90p, 2 hours for £1.50, 3 hours for £2.90, and 12 hours for £3.90. The Park and Ride on the Esplanade is open in November 7:00-19:00 (not on Sundays); it costs £2 per day and the bus drops off on Lord Street. Its that time again…Holiday Club at Grace! 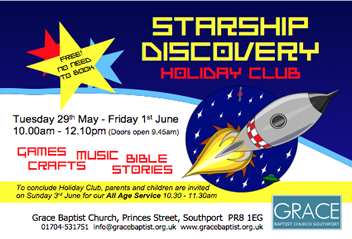 Our Holiday Bible Club runs this half term on Tuesday 29th May – Friday 1st June. Four mornings of free fun during summer half-term, for kids from reception through to year 6. It’s happening at the Grace Centre on the corner of Market St and Princes Street. It’s every morning from 10.00am – 12.10pm. It finishes with an All Age Service on Sunday 3rd June at 10.30am. Children from reception to yr 6 are invited to a fun packed morning of stories, games, and craft. Through the week we’ll be taking off on the Starship Discovery. Places do not need to be booked in advance. If you have any questions, you can send an email through our website, or call the church to speak to one of our Pastors, Stuart or Jonny on 01704 531751. 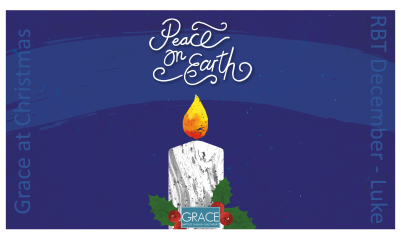 We welcome you to Christmas at Grace! We are holding four main services during this years’ festive season. Followed by mince pies and hot drink. With carols (old & new) & Bible readings from the Christmas story. Mince pies & hot drinks. A short all-age service to thank God for his kindness to us. Please do join us at any or all of our services, as we remember the sending of God’s only Son, who ‘dwelt among us’. For more details about our services, or about our church, send us a message here, or telephone 01704-531751. Its that time again…Holiday Club at Grace! But this time, it’s February Half-Term. Our Holiday Bible Club runs this half term on Tuesday 14th – Friday 17th February. Four mornings of free fun during spring half-term, for kids from reception through to year 6. It’s every morning from 9.45am – 12.15pm. It finishes with an All Age Service on Sunday 19th February at 10.30am. Through the week we’ll be ‘Meeting the King’. Are you searching or longing for something more in life? Or maybe you know someone who is? Life Explored is an informal and relaxed seven-week course. It’s for anyone who wants to find contentment and happiness in life. It starts 8.00pm on Tuesday 10th January 2017 and is being held in the Grace Centre. The course and all the material is free. You don’t need to know anything about the Bible, you can ask any question you like or just sit and listen. Speak to Pastor Jonny for further details. 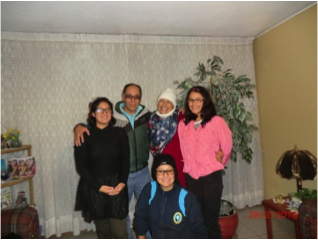 Please join us for our annual Missionary Weekend, 19th-20th November, when we spend time with each other and with our missionaries, as we learn more about their work telling the world about Jesus. We begin on Saturday at 10.00am with an fascinating morning of discovery, listening to four speakers telling us about God’s work. 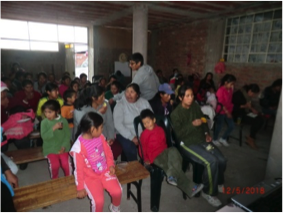 Our morning’s conference will be followed by a hot lunch, to which everyone is invited to enjoy across the road in the Grace Centre. 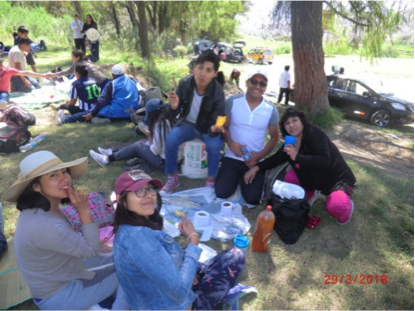 Saturday Evening: Youth Night – 7.30pm at the Grace Centre, including Pizza, Quiz, and Grill a Missionary…not physically grilling them, because that would be dangerous..
Our Missionary Weekend continues on Sunday morning, with some of our Missionaries. 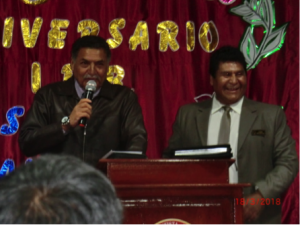 Then on Sunday evening, we are very much looking forward to speaking directly to our friend Anthony Green in the church in Arequippa, Peru. We are very grateful to all our visiting speakers for the weekend, and would encourage you to join us, and be encouraged in the work of the Lord. 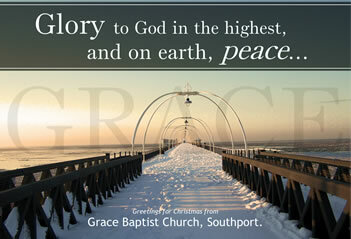 For directions to Grace Baptist Southport, just follow this link, HERE, where you will find a map and specific information. Welcome to Easter at Grace. 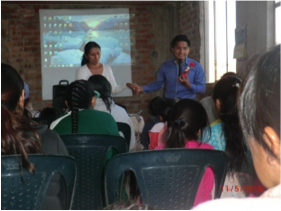 Morning Service, with hymns new and traditional, with Crèche and Sunday School. 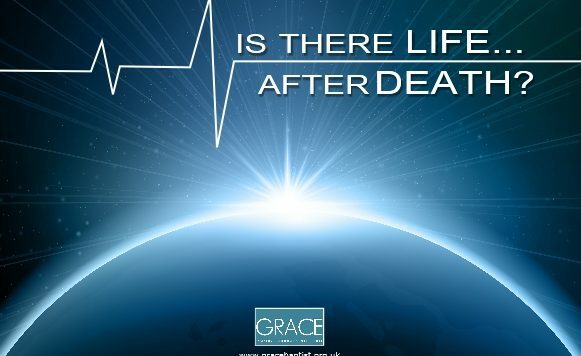 An all-age service, to consider how the death of Jesus Christ is God’s loving way to rescue us. Stabbed Whilst Teaching! Vincent Uzomah re-lives the day when a 14 year old boy stabbed him whilst teaching. He lived to tell the tale. Hear how his faith helped him to forgive. 10.30am: Easter Sunday Morning Service A service to remember and rejoice in Jesus, risen from the dead. 8.15pm: Bhasker Rao prepared the poison intending to take his life, when God answered his prayer and met with him. Hear his remarkable story. We are holding three main services during this years’ festive season. 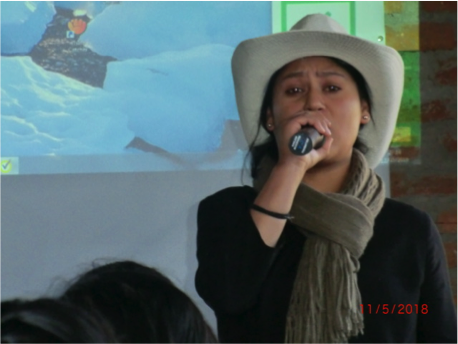 Including songs & readings from the children.